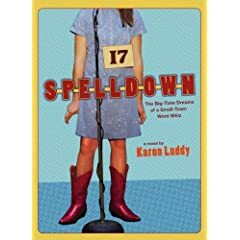 Officially titled Spelldown: The Big-Time Dreams of a Small-Town Word Whiz by Karen Luddy, this book is going to be a tough one to review. I loved it, I really did, but I am not sure I would recommend it to anyone I know in particular. This is the first novel for Luddy and I feel like she will really have a place in young adult literature. It is just that.... Grrrr.... I am not a prude, but come on with the language! I think I got tricked a little because my library had this book in the juvenile section and it is clearly NOT. I just really can't get past the way the main character used curse so much??? I swear to you I am no angel. I do not believe in judging a book on the language it uses. I am known for reading books with cuss words in them aloud to my class. (And of course politely changing the words to keep my lady-like image and explaining why an author would chose to use those particular words.) But with this book I couldn't even come up with a good reason. Then of course there was the topic of puberty and puppy love that comes in most any young adult book. Even that may have gone a little too far in this book. But... saying all that, I still can't say I didn't love it! In the story the main character, Karlene, is a thirteen year old spelling whiz, growing up in the 1960's, who is mostly trying to hold together a dysfunctional family. I can so appreciate Karlene's life, not as a child living in a dysfunctional world, but as an adult. The ups and downs Karlene goes through are truly something no child should ever live through. By spelling her way to D.C. with the help of a generous and mentoring teacher, Karlene manages to hold some parts of her life together. I think Karen Luddy did a beautiful job developing characters who really stand out. She sets the scene and develops the plot with a satisfying resolution. I really would only recommend this book to adults. I am sure a teen in the range of 13-15 could take a lot from the book, but I would never recommend it to anyone under that age. See for yourself, don't take my word for it. I agree with the language issue. I checked this out at our media center to see what you were talking about- wow.. some harsh words I must say. thanks for your review of Spelldown. Karen's husband actually plays tennis with my husband (in Charlotte, NC) and he told me about it since I have a big interest in YA literature. Your review has made me curious and cautious.